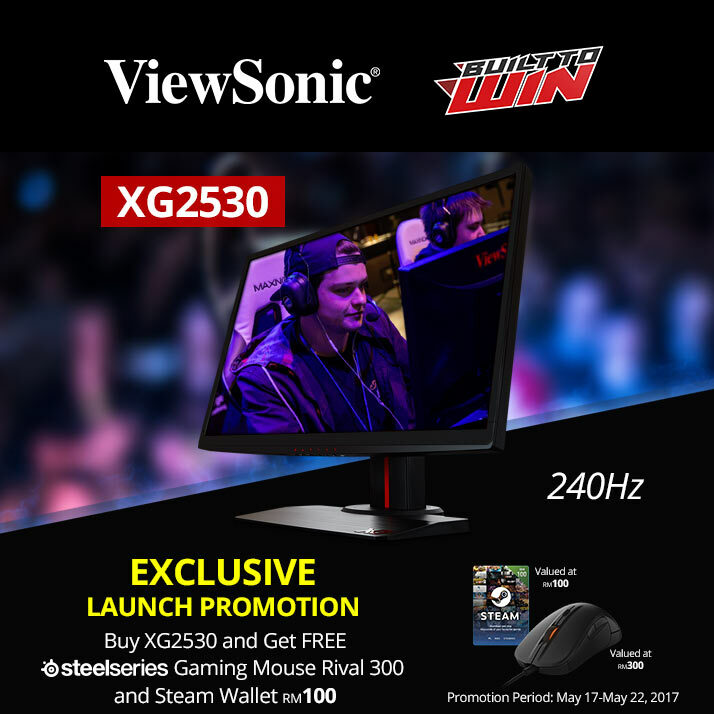 17 May 17 2017 – ViewSonic Corp. today launched the ViewSonic XG2530, a 25-inch (24.5-inch viewable) monitor with a refresh rate of 240 Hz, 1 ms response time and native Full HD 1080p (1920 x 1080) resolution. Packed with features for gaming enthusiasts, the ViewSonic XG2530 (Amazon | Lazada) can virtually eliminate screen tearing and stuttering for fluid gameplay during fast-paced action sequences. The XG2530 is engineered with an exclusive ColorX gaming mode that delivers optimum speed and visual effects, making it ideal for First Person Shooter (FPS) games, such as Overwatch. With a blazing-fast 1ms response time and low input lag, the ViewSonic XG2530 (Amazon | Lazada) provides seamless screen performance even in the most intense gameplay. ViewSonic’s XG2530 features a 240 Hz refresh rate, ensuring greater fluidity and remarkable visual effects, not limiting in-game graphics no matter how fast or swift the action. This eliminates frustrating tracers and motion blur by supplying the smoothest visuals possible. In addition to ColorX, the monitor comes with an arsenal of pre-set customizable visual modes that makes the whole experience better. A black stabilization function assists visibility options in dark scenes, while maintaining brilliant and vibrant colors and contrast. The “ColorX” option delivers the optimal refresh rate, response time, and color for FPS games. A “Game Mode” hotkey opens pre-calibrated settings that deliver the best combination of color and technology for specific gaming scenarios. In addition, the ViewSonic XG2530 (Amazon | Lazada) has two customizable “Gamer” settings that allows individuals to create and save preferences for specific games. The ViewSonic XG2530 (Amazon | Lazada) comes with versatile connectivity options such as DisplayPort 1.2, HDMI 1.4 and 2.0 which supports AMD FreeSync, as well as USB 3.0 A/B ports. Two integrated built-in speakers and audio-out provides a complete package. Previous : U Mobile Unlimited Hero P78 Postpaid Plan Revealed!